Fascinating history in this 2 Bedroom, 1 Bath log cabin on one of the finest smallmouth bass lakes anywhere. The cabin was part of a music camp for many years. The Chicago Symphony used to summer here in days before air conditioning! The cabin is on Indian Lake which is 354 acres and the 120&apos; of sand and stone frontage faces west for great sunsets! The cabin evokes memories from the classic summer cabin. It offers approximately 720 square feet and features a gorgeous stone fireplace (wood burning). 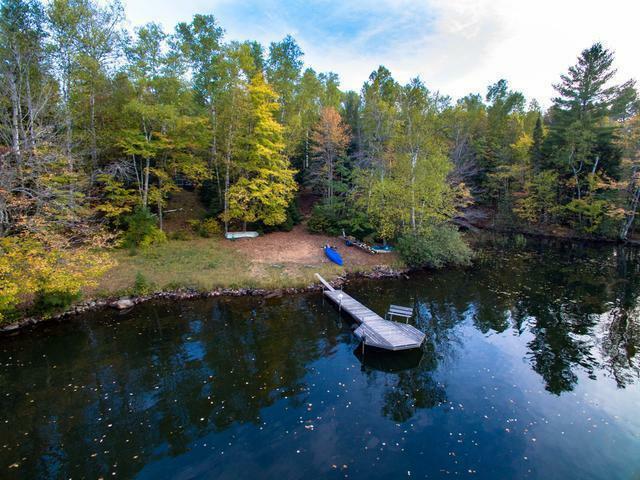 There are great views from the lakeside deck and the heavily wooded plat is .8 acres. The cabin sits at the end of the road and offers good privacy. The cabin has been a member of the family for generations. Make it a part of yours too!